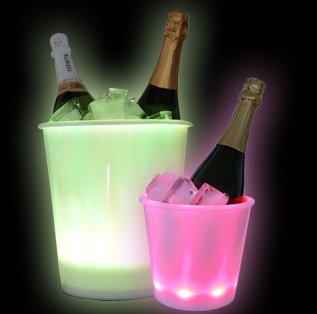 Our Light Up Ice Buckets make a spectacular, attention-grabbing display at any venue or event. Each Bucket's lights slowly change from Red to Blue to Green or can be stopped on any color desired. Choose from two different size Ice Buckets: 6½" diameter x 5¾" high, and 9¼" diameter x 11½" high. You can also have these Lighted Ice Buckets custom imprinted with your message or company logo. Requires 3 double A batteries (not included). For additional information on our Light Up Ice Buckets, Lighted Serving Trays, and other Bar Supplies, please contact us at 1-800-233-0828. Feel free to browse our selection of related products, such as Custom-Imprinted Glassware, Custom-Imprinted Plastic Glasses, Neon Serving Trays, and more.